Peaches; peachy keen, peaches and cream, peach ice cream and peach cobbler. Well, this post will be on peach cobbler and it is is peachy keen! Still, I often make it with blueberries. I am guessing most any fruit might work; blackberries, raspberries, cherries, plums, nectarines and apricots come to mind. This recipe is modified from one in Bette Hagman’s book, “More from the Gluten-Free Gourmet” and is based on a flour mix that will give you 4 cups of the dry ingredients for the topping. One cup of dry mix plus the other ingredients will make an 8×8 pan of cobbler topping. I bet two cups will make a big 9×13 pan of peach cobbler. I have made it over a camp fire a few times, delish and not that difficult either. But that will be a separate post as there are some tricks to campfire baking. Mix this up and store in an airtight container in the freezer. I always get the fruit cooking before putting the topping together so the fruit is hot and ready for the topping and can go right into the oven. 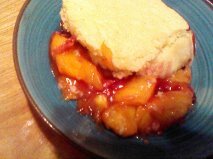 I used fat ripe peaches I bought at the Saucon Valley Fruit Stand for the first peach cobbler of the season and then some very flavorful ones from Bechdolt’s Farm Stand which made outstanding peachy cobbler. Mix the wet ingredients and then add to the dry mix in a big bowl. Mix very briefly, just until combined. I suggest adding the last tablespoon of wet stuff only if it seems to need it; better to have it thick than thin in consistency. 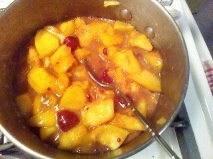 Mix the fruit and almond extract in a sauce pan. Stir together the tapioca, sugar, cinnamon and flour and mix into the fruit. Cook on the stove top, medium heat, for 3-5 minutes until it is thickened and hot. Pour into a buttered 8 inch square pan, top with big blops of the cobbler topping. Bake at 350 degrees for 25 minutes. The top should be light brown and spring back when you poke it with your finger. If it looks damp or squishy bake it 5 more minutes. Let cool 7 or 8 minutes before serving as it will burn your mouth right out of the oven! Some people love it with a scoop of vanilla ice cream. Cobbler is perfect just on its own. Between you and me, I recently made this cobbler with 4 fat peaches and a handful of fancy frozen raspberries as I felt there wasn’t quite enough peach slices. It tasted amazing! The zing of the raspberries and the ripe peachy flavor mingle with the tender cobbler crust in an incredible blend that must be tasted and enjoyed ASAP! It is great with just ripe August peaches, just made one of those today. FYI: for those who don’t eat dairy this recipe can easily be made without it; use canola oil as a replacement for the melted butter ingredient and the milk can be replaced with fruit juice or possibly even with water. The original recipe gave those modifications although I have not used the non-dairy one.